The Daily Laptop Backpack is a beautifully made backpack that fuses design, functionality, and convenience. The business-chic design is detailed with several pockets - including a flat pocket with a suspended, padded laptop sleeve (up to 17"), a larger pocket with a interior zipper pocket, and an easy-access front pocket for small belongings. 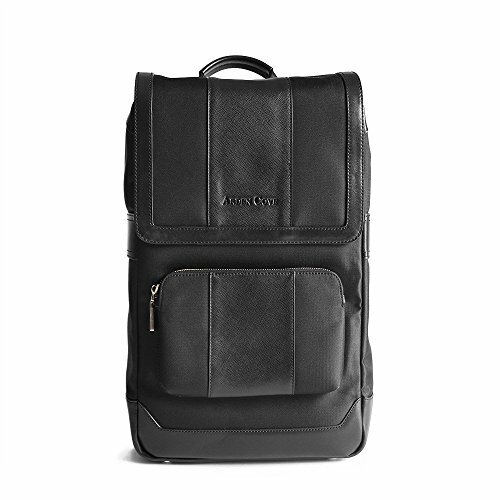 Finished with leather details and a front flap, it's professional and polished - a great style for school, work, or travel. FEATURES: suspended padded laptop sleeve fits up to 17" laptop, padded iPad/accessories sleeve, waterproof exterior, front flap with magnetic closure, padded airmesh back for added comfort, adjustable straps with airmesh, top handle for easy carry by hand. MATERIALS: Waterproof nylon, genuine leather, padded airmesh back & straps, leather bottom with metal studs to protect the bag's base, gold-finish hardware, satin polyester lining. Spot clean only. ORGANIZATION: a wider pocket for larger items with an interior zipper pocket, and a small, easy access front pocket. Waterproof body nylon exterior. Great for school, work, or travel: The Daily Laptop Backpack is a beautifully made backpack that fuses design, functionality, and convenience. The business-chic design is professional and polished, detailed with several pockets and a suspended, padded laptop sleeve (up to 17"). Made of waterproof nylon and finished with leather details. Makes a great practical and thoughtful gift! If you have any questions about this product by Arden Cove, contact us by completing and submitting the form below. If you are looking for a specif part number, please include it with your message.